FILE - President Donald Trump walks out of the Oval Office into the Rose Garden of the White House in Washington, June 1, 2017. President Donald Trump is facing his greatest foreign policy challenge to date in dealing with a nuclear-potent North Korea. But the test comes at a difficult time politically for the president. Recent polls show that Trump’s standing at home has weakened because of doubts about his leadership and his stalled domestic agenda. The president dominated the headlines this week with his blunt warning in the midst of more nuclear saber-rattling from North Korea. “They will be met with fire, fury and frankly, power, the likes of which this world has never seen before,” Trump told reporters during an event at his golf club in New Jersey. Trump’s remarks sparked strong reactions from both sides of the political spectrum. Democrats were generally critical. “The president’s most recent comments were recklessly belligerent,” said House Democratic leader Nancy Pelosi in a statement. Former U.S. ambassador to the United Nations Bill Richardson said Trump’s comments were “unfortunate,” but said the president could recover. 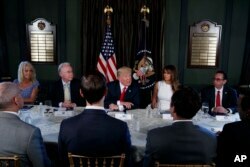 "I think the president has a chance to rally the nation, to address our country on what the policy is, but most importantly, to calm down,” Richardson told AP television. 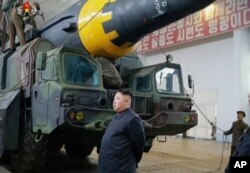 FILE - An undated still image broadcast in a news bulletin by North Korea's KRT May 15, 2017, shows leader Kim Jong Un at what was said to be a missile test site at an undisclosed location in North Korea. Americans got used to Trump’s tough rhetoric during last year’s election campaign. But many analysts contend that the standard is different now that he is president. But Trump defenders said his blunt warning is exactly what his supporters expect. President Donald Trump speaks during a briefing with members of his administration, Aug. 8, 2017, during a working vacation at Trump National Golf Club in Bedminster, New Jersey. Trump’s overall approval rating continues to hover in the mid to high 30s, a historical low for a new president. Trump faces a stalled congressional agenda domestically, and he often returns to his core supporters for a boost, as he did recently in West Virginia. Mayer added that it was still possible for Trump to turn around his domestic standing by reaching out to Democrats on a bipartisan compromise to shore up the health insurance markets after a Republican bill was blocked in the Senate. “By traditional standards, this is a very bad trajectory. That said, it is not too late in the game,” he said. Recent polls show a clear majority of Americans sees North Korea as a serious security threat. A recent survey by the Chicago Council on Global Affairs found that 75 percent now believe North Korea poses a critical threat to the U.S., up from 55 percent two years ago.